Is sodding the right method of planting a lawn for you? Sodding your yard is the quickest way to get that beautiful lawn. It is like having an instant lawn. It is also the most expensive and labor intensive method of planting a lawn. You can lay it at any time during the spring, summer or fall. 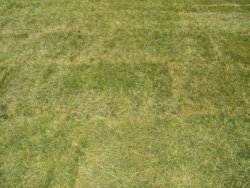 When should I use sod instead of seed? 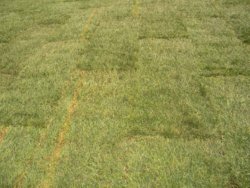 It works best in areas where grass is typically hard to grow (i.e. shady areas and slopes). In dry conditions, the soil will not dry out as quickly as soil where seed has been planted. As long as the ground isn't frozen, it can be laid at any time during the year. Remnant weeds left in the soil are not exposed to the sun-light; therefore, weeds have a very hard time growing. You will have a beautiful lawn a lot quicker. When should I order it and how much should I order? You should order it a week before you plan on using it. It is sold in rolls. Know the square footage that you need to cover and an experienced salesperson can help you determine the number of rolls you need. Be sure to order 10% more than you actually need. Prepare the soil the same way you would if you were planting a lawn with seed, plugs or sprigs. This includes using a starter fertilizer. Don't have the rolls delivered until you are going to use them. It will keep for up to 48 hours, but immediate use is best. 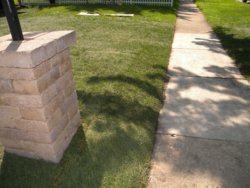 Tip....If you are sodding your entire yard or your yard is on the large side, have the rolls placed in various parts of your yard when it is delivered. It will be less walking for you. Moisten the soil the day before you plan on laying it. When you actually begin laying it you want the soil to be damp. Check it when it is being delivered. You can randomly select a few pieces and inspect them. You want to make sure it looks healthy and that there are not any weeds, insects or diseases. If you notice any problems, don't use it. Make sure the roots are white and moist. The rolls should actually be cool when you touch them. It is easiest to lay your first piece against a straight edge such as a driveway, sidewalk or planting bed. The second piece should be placed snugly up against the first piece. Be sure there are no gaps between the pieces and don't overlap the pieces. As you are laying it be careful not to stretch or tear any of the pieces. The edges of the sod are the first to dry out. If necessary, as you are laying it make sure to water. The second and remaining rows should be staggered. Think of the pattern when you lay brick. Be sure all seams are a tight fit. This is very important. Use a straight edge shovel or a sod knife to cut the smaller pieces to fill in spots later. The end result should be the lawn looks like one full carpet. Roll the sod with a water filled roller. Be sure it is filled no more than half-way. You want to make sure you roll lightly so the pieces do not move. You do not want to disturb that tight fit between pieces. This will level out the pieces to make sure they are laying flat against the soil. This helps the roots grow into the soil. Watering is very important. After it is laid you want to make sure it is watered well. The water should saturate the soil 4 inches deep. The edges dry out first, be sure to reach the edges of each piece to prevent drying out. Using sprinklers to water the area will work best. This will ensure all areas of the new lawn have been watered evenly. It takes approximately 1 week for the roots to begin to grown into the soil. At that point you can change your watering habits to once every other day. After 3 weeks you can change your watering schedule again to only a few times a week. Keep traffic to a minimum for the first few months. You want to make sure the roots fully grow into the soil. You can test the area by tugging on the sod in a few different areas. If the roots have been fully incorporated into the soil, it will not pull back easily. If you don't have the patience or you have an area where seed will not work, sod may be the option for you. You may have to spend more money, but you will have the results you were looking for a lot quicker. From Sodding to Lawncare Made Easy Home Page. 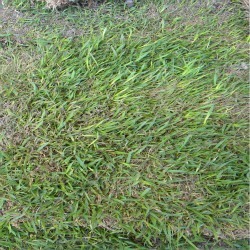 Newly laid Kentucky Bluegrass Sod - so new you can still see the patterns of the roll of sod. 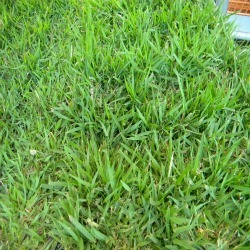 St. Augustine Grass Sod - A warm season grass. Grows is the Gulf Coast Region. Zoysia Grass Sod - A warm season grass that grows from the Transitional Zone and South.